Hamilton Branch State Park in South Carolina, about 23 miles north of Augusta, Georgia. 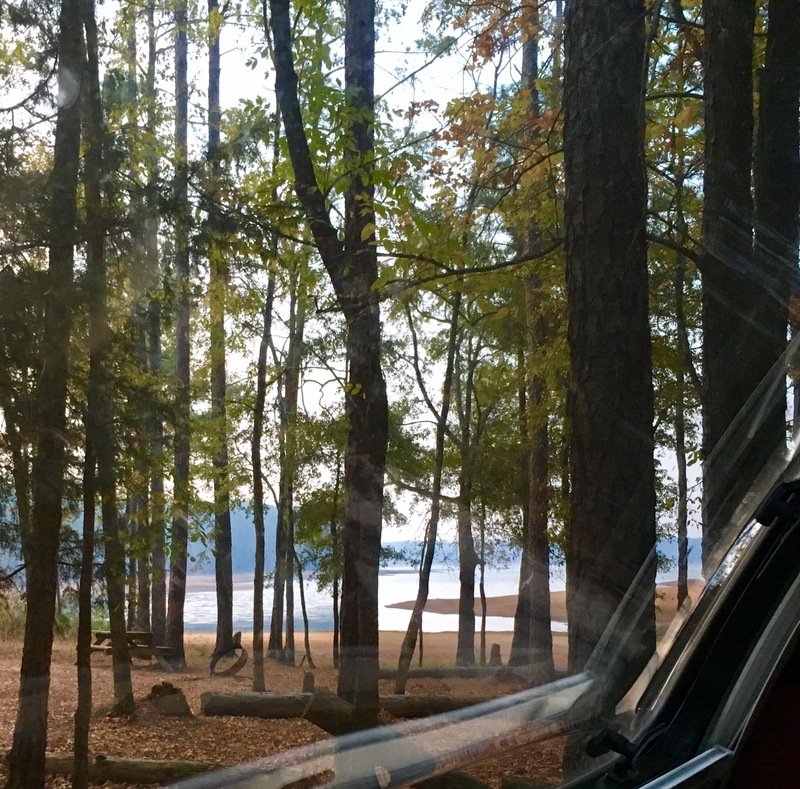 We considered staying longer in the Asheville area – great mountain biking and so much to do, but the air was extremely smokey from numerous forest fires – so dry there! And the weather was dipping into the 20’s at night. We are hoping not to have to winterize the trailer. From what we have read and heard, we are ok down to about 27 degrees for a night, as long as the day warms up somewhat. The weather in SC is forecast to be 60’s and 70’s with lows in the mid-forties. There is a little smoke in the air at times, but mostly clear. Mountain biking report: The FATS (Forks Area Trail System) is worth it – we are having fun on the trails. Flowy, some challenges and climbs and some grin-inducing downhills. The locals say the best ride is counter-clockwise, and that seems true, although the trails can be switched up for variety. The South Trailhead is the larger one, with four 5.5 to 7.5 miles loops, that can stand alone or be combined into a variety of rides. Excellent trails, with great signs! The North trailhead is down the road a few miles and connects to two more really nice loops. We are staying in this area for a few extra days, as the parks are packed any further south, probably because the weather forecast is nice and Thanksgiving week approaching. We rode one day at the Modoc Trail, a 6.5 out and back trail near a creek. It started off pretty decent, but then knee deep leaves, downed trees, debris on the trail and some areas where we were unsure where the trail was turned this into a less than stellar experience. Not recommended and not going back. Although we didn’t stay at the Fork Licks National Forest campground, because they had no water due to a faulty pump problem, and they closed on November 14 for the winter, we went to check it out and the place looks pretty decent – we could back Gerry into most of the spots and the price would be right. There are only about 8 first-come first-served sites. We rode the two trails accessible from the campground. The first (5.5 miles) was pleasant – a good ride through beautiful woods, with nothing technical, and the second, the Fork Licks trail (2 miles) was a nightmare. It reminded us of a kayak trip we took a few years ago where we had to clamber out of our boats over and over to haul over snags. We were off our bikes more than on – a couple of dicey creek crossings with big rocks and water, and downed limbs and trees galore. Whew. It would have been a tough hike even without our bikes. Pretty though. Going to stick to the Fats trails and joy the fun! This entry was posted in eco travel, Mountain bike. Bookmark the permalink.